﻿The University of Maryland's Office of the Vice President for Research is highlighting ISR in the October 2010 issue of its bi-monthy publication, Research@Maryland. 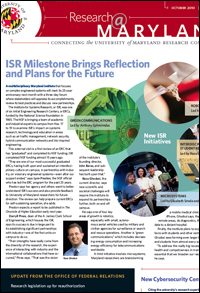 The front page story talks about ISR's 25-year history of cutting-edge systems research, its upcoming visit from the National Science Foundation (NSF), and the directions ISR research is taking in the future. ISR was one of the six original Engineering Research Centers founded by NSF across the country in 1985. From Nov. 17–19, a team from NSF will visit campus to learn about ISR's journey since it graduated from the program almost 15 years ago. “They are one of our most successful graduated ERCs, having built upon and sustained an interdisci¬plinary culture on campus, in partnership with indus¬try, on visionary engineered systems—even after our support ended,” says Lynn Preston, the NSF official who has led the ERC program for the past 25 years. View a PDF version of the Research@Maryland story here.